Wendy Wax is one of my new favorite authors, and I loved her book, Ten Beach Road, so much that I recommended it for the Mother’s Day issue of Women’s World Magazine. In Ocean Beach, readers will be reunited with the heroines of Ten Beach Road — Madeline, Avery, and Nicole — as they come to South Beach in Miami to renovate yet another historic house for the television show Do-Over. While the women have no qualms about working together again and having it televised, they are less interested in having their personal lives shown to the world on television. 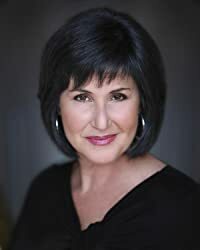 Today, I’ve got an interview with Wendy Wax. I hope you give her a warm welcome. The characters from Ten Beach Road return in Ocean Beach. When did you know you were not done with these characters and their story and how soon did you begin writing it? When I finished writing and revising Ten Beach Road I said goodbye to the lovely ladies of Bella Flora thinking that I had given them enough closure to send them off to live the rest of their lives and either find their happy endings or not in the imagination of my readers. But doing a series was something I had always thought about and for some reason as the launch of Ten Beach Road approached and as I talked to bloggers, bookstore owners, friends and fans about the book, ideas for a sequel began to take shape. This was new territory for me and it was very exciting. Over the years as I visited with book clubs and readers to talk about my books I was often asked if there would be more on some of those characters or stories and while I so appreciated the connection readers were making with my characters, for me they were complete and I had no desire to go back. But Maddie, Nicole, and Avery were different – and the idea of tackling another renovation with them for another sweat-soaked summer, seeing where there lives were headed and giving them new challenges was just too hard to resist. Shortly after the tour for Ten Beach Road ended, the writing of Ocean Beach began and now as Ocean Beach is about to hit shelves, I already find myself thinking about new renovation projects and new sunset toasts for my gals, so be sure to stay tuned! Ten Beach Road was a hit with a number of women and made my recommendation list for Women’s World Magazine in May. How many readers have said they share their books with their mothers, sisters, and friends? And have any readers said they’ve shared your books with the men in their lives? When I discover a new author or come across a book that I love, it’s automatic for me to share that information with the women in my life, so I love hearing from my readers that they “introduced” me and my work to their mothers, sisters, daughters and friends. 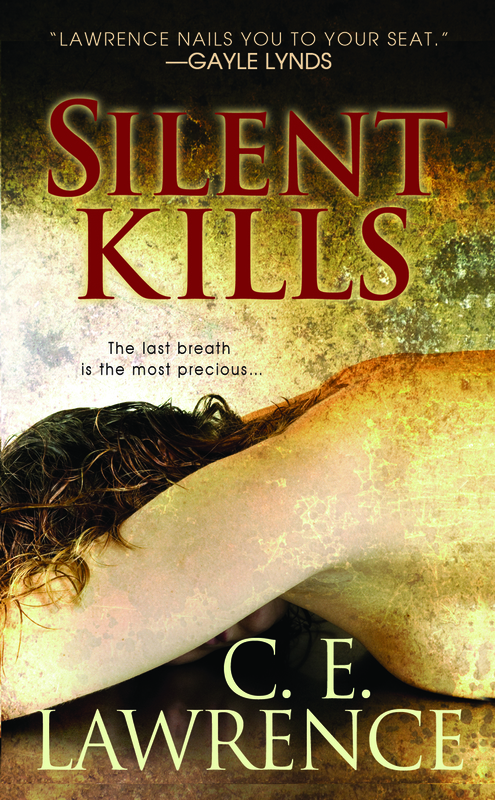 Especially since I write about the bonds between women and I feel those relationships are so important in life. Probably the most fun is when readers say “I told my mom/sister/friend all about your books but I made her get her own copy because I don’t want to let mine go!” What author doesn’t love to hear that? I do hear from some readers that they’ve tried to get their husbands to read my books, because they’d like them to a) understand what women are thinking, b) understand why we need our women friends, c) act (and look) like Joe Giraldi from Ten Beach Road and Ocean Beach or d) all of the above. When writing your novels, do you start with an event in the news or a character? Please explain. For me every book is different. In one case it may be an idea for plot that gets me started, in another case it might be a character that begins to take shape first or a news story that gets me thinking. In Ocean Beach it was a combination of things… our country’s obsession with misbehaving and self-obsessed celebrities was something that I touched on in Ten Beach Road and wanted to explore further. Then the idea of contrasting that with an “old school” celebrity who was a true gentleman and class act from the Vaudeville days began to take shape. Also, because Ten Beach Road was very current event based (the women are strangers who come together when they lose everything in a Madoff-style Ponzi scheme), I wanted Ocean Beach to be driven much more by their personal struggles. Book bloggers have become very influential in the publishing world. Have you enjoyed your interactions with them on blogs, Twitter, and Facebook? And what advice would you give to other authors? It’s a very different world now than it was when I first started writing. I love that the Internet has made connecting with fans so direct and so easy. In many ways, book bloggers are like independent booksellers in that they make a personal connection with readers, and love to share and recommend books and authors that they discover. Interacting with people like that, who are passionate about books and about reading, is something I will never get tired of, no matter what the medium. Please recommend a favorite poet or poem and why. I wish I had more time to read and enjoy poetry than I do. In fact with two teenage sons, a husband and some tight deadlines from my publisher, I wish I had more time to read in general! That said, I love how some of the modern poets like Lee Rossi (Wheelchair Samurai) and Laura Kasischke (Space, In Chains) incorporate modern imagery from our everyday lives into such an old art form. I have to also admit that I’ve always loved the poem Phenomenal Woman by Maya Angelou mostly because I think it would be lovely to feel that way about one’s self every day. Thanks, Wendy, for answering my questions. Wendy Wax‘s Ten Beach Road (my review) is out in mass-market paperback, so for those of you who have missed out on reading this book and have a book-buying budget, now is the time to grab a copy. I absolutely adored this book and its characters, strong women –Madeline, Nicole, and Avery — who face a financial crisis and rub one another the wrong way but manage to pull it together to restore their only remaining, shared asset, a house. I loved this book so much for its summer feel, humor, and strong characters that I just had to share it with my mother, who normally reads action thrillers. She loved it. I even loved this book so much that it was one of my picks when asked by Women’s World Magazine which summer, feel good books I’d recommend for mother’s day. (My recommendation made it into their May 14th issue on page 45, if you’re curious). An eternity later, they hobbled out to the backyard just as the sky was beginning to pinken. Bedraggled, they dropped into the beach chairs with a scrape of aluminum against concrete. “I don’t think I’ve ever been this dirty in my entire life.” Madeline plopped a family-sized container of hummus and triangles of pita bread on the upside down packing box that their Sam’s purchases had been carried in. “Me, neither.” Avery dropped a bag of Cheez Doodles beside it and swiped the back of her forearm across her forehead, managing to add another streak of dirt to her face. Madeline looked ruefully down at herself. Together they could have posed for the illustration of “something the cat dragged in” – even Nicole in her high-end running clothes and her hair pulled back in a glittery clasp. This was only day one; she could hardly imagine what they’d look like after the long, hot summer that lay ahead. Her arms were so tired that it took real effort to lift even the small plastic cup, but she nonetheless touched it to the others. “Cheers!” she said, and they nodded and repeated the toast. “Will you be able to run your business from here?” she asked Nicole as they contemplated the sinking sun. “Oh, is he retired?” Avery asked. Madeline felt her cheeks flush. Nicole raised an eyebrow and poured them all another glassful. Her teeth worried at her bottom lip. She hadn’t meant to say so much. Or sound quite so pathetic. Madeline saw Nicole shiver slightly. “Are you cold?” The sun had not yet set, but its warmth had diminished. “No.” Nicole turned her attention to the boat traffic in the pass. A Jet Ski swooped close to the seawall, its plume of seawater peacocking behind it. The rider was big shouldered and solid with jet black hair and heavily muscled arms. Nicole watched idly at first, presumably because he was male and attractive, but straightened in surprise as the rider locked gazes and offered a mock salute before revving his engine and zooming away. “He must have thought I was someone else,” Nicole took a sliver of pita and chewed it intently before changing the topic. “So, how many kids do you have?” she asked Madeline. They sat in silence for a few minutes, sipping their wine, as the sun grew larger and brighter. A warm breeze blew gently off the Gulf, stirring the palms and riffling their hair. They fell silent as the sun burned with a new intensity, shimmering almost white, then turning golden red that tinged the Gulf as it sank smoothly beneath it. “Well, that’s a good thing,” Nicole snorted. “All right, hold on a sec,” Madeline said. She went into the kitchen and retrieved a second bottle of wine from the fridge, grateful that John Franklin had had the power turned on. As she refilled their glasses, she searched for a positive. Nicole was right, it wasn’t an easy task. They clinked and drank and turned their gazes to Nicole. Madeline could hardly wait to hear what she would say. The mass-market paperback release of Ten Beach Road is in advance of the June 26 release of the sequel, Ocean Beach, in which the three lead women — Madeline, Nicole, and Avery — from the previous book are back. I just knew Wendy Wax was not finished with these characters! Yes, you’ll want both books. Don’t forget to follow Wendy on Twitter and Facebook. 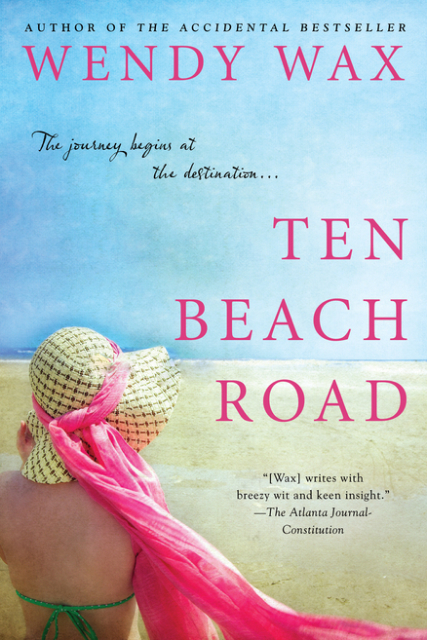 To enter to win 1 copy of Ten Beach Road by Wendy Wax you must be a U.S. or Canadian resident. Leave a comment below by June 1, 2012, at 11:59PM EST to be entered. 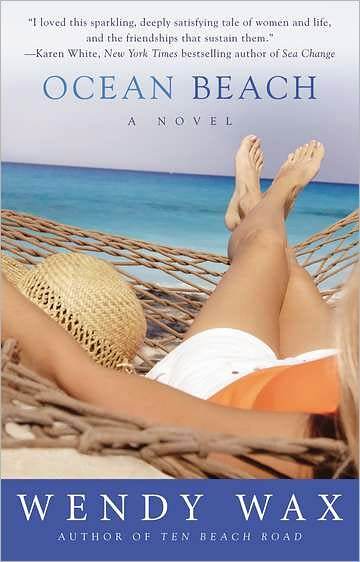 If you’ve already read Ten Beach Road, leave a comment telling me why you want to read Ocean Beach to be entered by June 1, 2012 at 11:59PM EST.